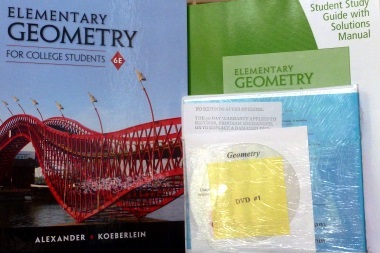 Geometry 6th Ed. is 8 DVDs, hardbound color text, complete solutions guide, and student technical support. Textbook notes: The textbook has 11 chapters and each chapter is divided into sections. Each section ends with "exercises" which often include "application problems." Each chapter ends with a Chapter Summary, Chapter Review, and Chapter Test. Student Solutions Manual Notes: The End of Chapter Review Exercises and Chapter Test support odd problems. Disc 1 - 2 hours 14 min. Disc 2- 2 hours 11 min. Disc 3- 2 hours 22 min. Disc 4- 2 hours 5 min. Disc 5 - 2 hours 11 min. Disc 6 - 2 hours 15 min. Disc 7 - 2 hours 19 min. Disc 8 - 2 hours 36 min.